Even if you don’t win, a new sweepstakes from Guinness offers a bit of creative fun. In the Ultimate Guinness Home Bar contest you can draw your idea of what would make a perfect bar for your home, write an essay about why you deserve the bar and Guinness might build it for you. The winner will be selected by Bill Walton, a hall of fame basketball player and notorious Grateful Dead fan. The bar comes with a three-keg cooling unit. A press release suggests it is ” ideal for serving the Irish trio of Guinness Stout, Smithwick’s Ale and Harp Lager on draught” but we don’t think the Guinness police will be checking to see what actually ends up on tap. The grand prize winner also will receive three tap handles, mirrors for the back bar, a bar table and four bar stools. i think the perfect bar would have all brown tan and black colors. i could fit it between my living room and my kitchen. 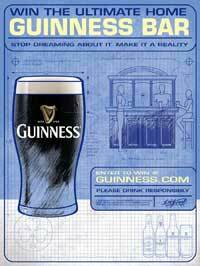 I’d need awesom guinness logos on the glass at the back of the bar with tall glasses with a least a 2″ head on the top of each one. I would need three good buddies and race on the tube for it all to be most excellent. i think i should win because i was the first person i know to drink the most excellent of all dark beers in my area. i searched the world over and finnaly found what i was looking for. i had to tell every one i knew of this discovery. i made it my mission to tell everyone i knew that there was more out there than the same old crap that our fathers grew up drinking. when sitting at the bar i make sure everyone around me has at least a sip of the guinness before leaving my company. i also brew my own beer and once again i find myself drinking a guinness while trying to brew something that tastes like guinness. it’ s went from being just a beer to being a most awesomely excelent way of life and i’d just like to say thank’s guinness guys. The question is why should I get the new bar in my house and the easy answer is why not me! But here is really why I think it should go to my family. I have tried on three different occasions to save enough money to put a professional bar in my home but something always comes along that is far more important then a bar ie new kids being born, providing the best christmas possible for the kids and wife, family sickness, taking care of my parents, getting those special shoes so my kids can feel good about themselves. It never seems to be anything just for me, I am not whining but it seems like all of the family burden falls on the man of the house. I am fine with my role and I also am proud to be a provider but it sure would be nice to just have that one thing that says ” this is John’s bar”. I truly love Guinness and would be proud to display it in my home and by the way I have the perfect spot for the bar. I think that Arthur Guinness and his grandson Edward Guinness (aka Lord Iveagh) would approve of my house for there name. On a side note it would be nice if you would get involved with the Celtics and bring another Championship to Boston! Oh and I think it would be nice to see the old Mr. Walton red beard and lamb chops back just for fun. Thanks for you consideration. The perfect bar table for me would be one one that sat atleast three people… one that would be around 3 ft long to make a divider between my tiny kitchen and tiny living room. We cant fit a table and its three of us. Im a nursing student and my hippie fiance is a wannabe HVAC tech that cant get a job… Then theres my fiances son.. hes wonderful Im only 20 hes 6… It was difficult at first but gotta love the kid!! Wakes us up singing FIRE ON THE MOUNTAIN by G.D… but my point is… I have been looking for a cheap bar table for sometime but hell they are not cheap!! So my perfect bar table would really be any table!! Have fun with it!